So, the exhibition is over for another year, and things have now pretty much settled down into the usual routine, namely carving, carving, and more carving! The story in the local edition of the Yomiuri that had brought in our first collector also gave us another interesting contact. We got a phone call from a Mr. Kenji Seki living in Hachioji, who introduced himself as a woodblock printer. 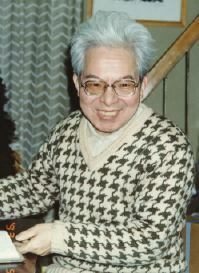 He had been surprised to read in the paper about a 'gaijin Ukiyo-e printmaker', and visited us to see what was going on. Seki-san seems to be working mostly on 20th century designs, and does the printing work for some quite well-known modern print artists. It was interesting for me to meet him. In the old days, an apprentice grew up without having a chance to see how other people did their work, but simply followed his master's methods. I am not bound by any such restrictions, for better or worse! (I do have to be careful when talking with these craftsmen. When I am talking to A-san, I can't say, "But B-san does it this way ..." and vice versa. I have to respect their privacy, and keep quiet about what I see in other workshops ...). There is one thing though, common to both Seki-san and Matsuzaki-san, the printer who has been my main 'guide', and that is their openness and willingness to help me. By this time I was into the third print in the series. I visited the Toyo Bunko again, and ordered a set of small colour transparencies of the entire series, for use in making the hanshita for carving each month. I also discussed with them (somewhat belatedly! ), the business side of my venture, and they expressed no objections to my using their original volume in my endeavour, but simply asked that in return I send them a copy of each finished print for their collection. A big chance came in mid-July. In response to my little flyer earlier, a Mr. Hashimoto from the Jiji Gaho news agency visited us for an interview. He was polite and a bit reserved at first, but at one point in the discussion, in response to a question of his, I let him see a small notebook I had made. This consisted of small copied reproductions of Shunsho's pictures, in combination with the poetry, and accompanied by my notes on possible colour combinations, etc., along with expected dates of completion for each print, right up until December 1998. He studied all this, sat back and looked at me without speaking for a minute ... and then, "You really do intend to go through with this, don't you!" I guess my reply must have sounded believable enough, for he became quite enthusiastic. The rest of the afternoon was a whirlwind of photograph taking and questions, and then about a month later, I received in the mail a copy of his 'Foto' magazine, with what is one of the best-written, best-photographed articles to appear on my work to this day. Apparently the readers thought it was well-written too. We received a batch of phone calls over the next few months, and eight of those inquiring became subscribers to the print series. Of course this was a fantastic help. Other people were excited by what I was doing! I soon started to receive letters and cards from these new collectors, expressing thanks and encouragement for what I was undertaking. I was really on my way! Back we go again to Moto Asakusa, down the streets leading east from Ueno Station, first through the cluster of shops selling pachinko parlour supplies, then along the wide avenue past the dozens of shops selling Buddhist altars and household Shinto shrines ... We've been to this area twice before in this series of stories, once to see Shimano-san the woodblock planer, and then again to visit Kaneko-san, the bamboo skin supplier. This time my destination was the tiny hole-in-the-wall shop of Mr. Akio Miyagawa, the man who makes the brushes I use to spread pigments over the woodblocks. The shop is indeed tiny, and I think I can touch both walls if I stretch my arms out. The space is made even smaller by large cabinets and drawers stuffed with brushes of many types, and just inside the door is a small raised platform where the work of 'sewing' the brushes together takes place. As I sit there today on the edge of the platform and chat with Mr. Miyagawa, his wife Tsuyako kneels beside me working on a small printmaker's brush. 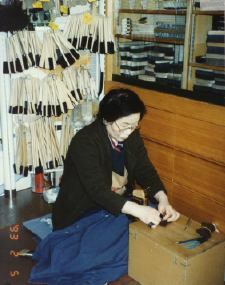 In front of her is a wooden clamping arrangement gripping the piece of wood that will become the body of the brush. This wood has been drilled with a number of small holes, and she is now busy feeding a steel wire through these one at a time, and tying small bundles of horsehair tightly into place. When she is done, she will tack on a cover, trim the hairs to length, and then soften the tips, so that it will be ready for use by a waiting printmaker. This type of work has been going on here on this little platform for about 70-odd years now, since the business was established back in the Taisho era. Perhaps you are surprised that I didn't say "...since back in the middle Edo period...". Well, businesses come and go as the times change, and even though Miyagawa-san's shop does not have an ancient history, he is recognized as one of the main suppliers of brushes for traditional craftsmen, and these men make up most of his customers. 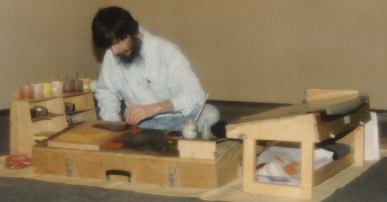 And they are not only woodblock printmakers. While we were chatting, we were interrupted by a couple of people asking if he had the special brushes for painting the faces of some 'bunraku' dolls they were making. His answer was not, "Yes", but rather, "What size would you like?" Of course he had them handy. He also has brushes for lacquer artists, Kamakura-bori style woodcarvers, Buddhist altar makers, kimono dye artists ... the list is endless. When I asked him how many types of brushes were here in the shop, he just shrugged his shoulders ... uncountable! There's quite a menagerie represented. Mundane animals like horse, goat, badger, pig, sheep, etc., as well as the more exotic (and expensive) such as sable. The hair comes from many countries around the world, with the largest supplier being China. The specialization in tools for traditional craftsmen is reflected in the way his brushes are measured. A hardware shop around the corner sells paintbrushes for carpenters sized by the centimeter. A brush I bought from Miyagawa san recently was described as 'ni sun go bu' (2 sun 5 bu). Are many of the readers of this newsletter old enough to remember that 10 'bu' make a 'sun', and 10 'sun' make a 'shaku'? (Perhaps Western readers who have learned simple numbers in Japanese will now realize just what the well-known word 'shakuhachi' means ...) Miyagawa-san sometimes receives orders for brushes with the body size expressed in 'sun', the hair length in centimeters, and the hole sizes in fractions of an inch! A couple of years ago I made a short appearance on a television quiz program. I had been a bit surprised when the producer phoned me, as I knew my Japanese ability wasn't good enough yet for me to join such a program, but it turned out that they didn't want me as a panel member, but as a 'topic' for the quiz. There are a number of aspects of traditional printmaking that seem a bit puzzling to the layman, and they wanted to try and stump their panel members. Just what were they interested in? Well, rather than tell you directly, I thought that maybe we should have our own quiz, right here in 'Hyaku-nin Issho'. That program only used one point from my work, but I have prepared a small group of ten questions concerning my printmaking work and some of the materials I use. Some are quite easy, some might seem more difficult. Just to make it worth your while, I'll offer a small prize. All entries received before the next newsletter comes out, and with at least some questions correctly answered, will receive a package of some hand-printed letter paper I made recently. Send me your answers on a postcard (or on the back side of the little blue Post Office form next time you make a payment). Have fun trying to figure these out, and it's no fair phoning Matsuzaki-san for advice! Most of my pigments dissolve readily in water, but a few of them do not (indigo, beni, vermillion). What do I use when mixing these pigments? I have a bottle of camellia oil in my workshop. What do I use it for? You know that 'takenokawa' (bamboo skin) is used in printmaking work. Can you identify three of those uses? Most traditional printers make frequent use of a yellow pigment known as 'seki-o'. I refuse to use it. Can you guess why? When I am printing, what goes on first, the black outlines or the colours? So, just what is that sharkskin used for? The modern name for my main carving knife is 'chokokuto', but the older carvers have a different name for it. What is this? In my workshop I keep a smoothly rounded oval-shaped black stone that just fits inside my fist. For what essential job do I use this? Don't be discouraged if some of these seem too difficult. Of course, full answers will be in the next newsletter, but don't wait 'till then. Give them a try ... I'm waiting to see how well you can do!